This high-speed, wireless network adapter plugs directly into select Epson projectors allowing quick and easy access to the LAN or peer-to-peer networks without wires or cables. When used with Epson Easy MP Monitor and Network Projection software, users can remotely access and control projectors over the wireless LAN. 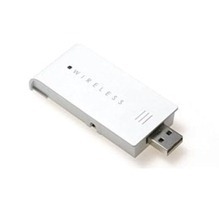 Note: When used with the BrightLink Interactive projector, the Wireless 802.11g/b/a adapter allows for wireless network connection and management of the projector. Use of the BrightLink USB cable is still required for interactive functionality. How to set up a wireless projector on an wireless infrastructure network? In order to set up a connection between your projector and a computer, you must install the Wireless LAN unit in the projector. Also, install EasyMP Network Projection (formerly EMP NS Connection) from the supplied EPSON Projector Software for Meeting & Presentation CD-ROM onto your computer. To use the full EasyMP functions, install all the software from the CD-ROM. See your projector's User Guide and EasyMP Guide for help. There are two methods of connecting the projector and a computer via a network by using EMP NS Connection; 'Advanced Connection Mode' and 'Quick Connection Mode'. From a conference room, you can open and project a file stored on a computer or file server in another room. You can monitor and control projector's on a network from the computer.